So I come to the end of The Hunger Games trilogy. Mockingjay starts in District 13, the district that was supposed to be deserted after the Dark Days of 75 years ago, the district that no longer exists. And it doesn’t exist…at least not above the ground. The war between The Capitol and the Districts is in full flow; District 12 has been burnt to the ground and the rebels are slowly infiltrating the remaining districts, turning them against the Capitol one by one. Katniss has been freed from the Arena of the Quarter Quell and asked to help the rebel cause; Peeta has been captured by The Capitol, and who knows what tortures they have in store for him there. I have put a spoiler warning, but I am going to try and write this with as few as possible. In all honesty, this was my least favourite of the series, for me it lacked the structure of the previous two as there was no Hunger Games to base the narrative around. This is not to say that I didn’t enjoy Mockingjay because I did, but I missed the games. Anyway, on to what I did enjoy. Perhaps my favourite parts were where we got an insight into the lives of the Victors and how they continued to be used as Capitol pawns years after their victory. I loved getting an insight into why Haymitch and Finnick behaved in certain ways, and I personally would like to have read more about some of the other contestants and their treatment, but that is understandably a whole different book, and me just being curious about what makes people tick so to speak. Katniss continued to live up to my expectations about positive female role models in literature. Yes, there is the love triangle between her, Peeta and Gale, but she never turns soppy about it, and instead conveys mixed up, yet believable emotions about the difficulty of who to choose, if either of them. This is a constant subplot to the main action, which is why it works so well as it isnt thurst in the reader’s face every two sentences. In the end, her decision was a shock to me, but her reasons for it made perfect sense and were in fitting with what we learn about her as the trilogy progresses. And the best bit for me – Collins doesn’t chicken out of killing major characters, although I guess this was to be expected since the actual Hunger Games are all to do with death anyway. It’s not like another well known literature/film franchise which skirts coyly around the issue of death. I was a little sad at some of the deaths, but then I like a roller coaster of emotions when I read, so I shouldn’t complain. Perhaps the one bit I didn’t like or agree with was the decision for one final Hunger Games in light of the outcome of the rebellion. It didn’t make sense and I don’t quite agree with the ‘eye for an eye’ idea it seems to represent. 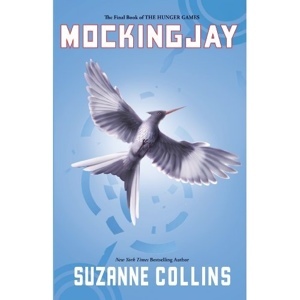 Overall, I thoroughly enjoyed this series, but for me The Hunger Games was the best of the trilogy. It had me enthralled from the off and was unlike anything I had read before. I can understand why so many of my students are gripped by the series and I would highly recommend them to anyone who has yet to pick one up. I am looking forward to the release of The Hunger Games:Catching Fire film later this year. Back in October half term I read The Hunger Games and I foolishly waited all this time to read the second in the trilogy, The Hunger Games: Catching Fire. However having watched the film a few weekends ago I decided to raid the school library to pick up the second instalment. Katniss Everdene survived The Hunger Games, however in doing so she unwittingly deceived The Capitol and became the catalyst for rebellious talks from the various districts that make up the futuristic country of Panam. On her victory tour Katniss begins to witness the quiet mummers of rebellion and begins to wonder how she can play her role in this act of defiance against The Capitol. But before she can act Katniss finds herself back in the deadly arena facing twenty-three new Tributes of a completely different calibre. Before writing this review I went back to look at my initial thoughts on the first novel, reminding myself of the reasons I loved it and why I found it so engaging. One of the things I wrote about was Katniss as a heroine and how refreshing it was to have a strong and independent female role model within teen literature. I still agree with this and feel it is a feature that comes through in Catching Fire as much as it did in the first novel. Katniss’ fit to survive and defy The Capitol at any cost shines through and is a key device that helps the narrative progress. 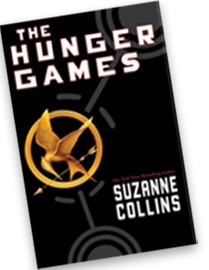 Despite the unimaginable world of The Hunger Games Collins still writes about aspects of teenage life that those in the real world can relate to, most obviously the ill fated and complicated love triangle. It is always in the background of Katniss’ thoughts and motivations, and I love that although it is a key part of what spurs her on it does not become the primary focus of the novel and nor is it rammed down the readers’ throat every 5 seconds. There were parts of the novel that I had to reread as I wasn’t 100% sure what had happened, and I am sure when I reread it (which is inevitable) I will pick up on lots of little hints that I missed on first reading. However this is part of the magic; there is nothing better than a book that grips you from the off and that you are desperate to turn each page to find out what happens next. I am a little sad that I don’t have the third book ready on my bedside table ready to go right away, but patience is a virtue and all that. I can’t decide if I want to dive right in to the last instalment, or if I will change pace and read something else first, saving the excitement for a few weeks time. What a pickle! After weeks of teaching English and seeing numerous girls reading this trilogy during silent reading time, I decided it was time for me to beginThe Hunger Games. I am always slightly sceptical about books/series of books that receive such hype, especially as I was recently left disappointed by a certain Swedish thriller series that receives a lot of press, so I think I have been putting off picking up this book, despite purchasing it months ago for this very reason. I need not have worried, I loved The Hunger Games and found it difficult to put down my kindle and actually do some school work. For those who have yet to read this, see the film, or who have avoided hearing people rave about this series, The Hunger Games is set in a futuristic version of America; a rebellion has torn the country apart and many are living in poverty and still being punished for events from decades ago. The country is ruled by the Capitol, and each year as a reminder of the dangers of defying the Capitol, The Hunger Games are staged; a fight to the death between two children from each district of the country – think Battle Royale and you pretty much have it. The Hunger Games follows the journey of Katniss Everdeen, a teenage/popular fiction heroine I can actually admire and who does things on her terms, but showing great humanity and emotion in such a difficult and challenging situation. I wanted to read about her journey and continued to do so out of a connection to the characters and not because I felt I should finish the book to see what all the hype is about. I am so happy there is actually a female character in popular teenage fiction who is strong, determined and resourceful, kind and intelligent. I am sure there are people out there who can name many who fit this criteria, but after a certain vampire/dark romance series giving off the whole obsessively in love, ‘I must marry him as soon as I finish school or my life will be over’ vibe, it is great that there is a balance. Not that I am crazily feminist, but I like to think we have moved on from girls only wanting to get married. Now I realise I might have shot myself in the foot here as I haven’t read the next two books, but I am praying the trilogy ends in a fitting and believable way, which so far i am sure it will; I hate an anti-climatic ending, especially one where it appears the author has chickened out of killing any major characters! For now it is back to school work and baking, currently attempting to make jam!